current Director and Chief Conductor of the Opera of the Slovak National Theatre and Permanent Guest Conductor of Slovak Philharmonic Orchestra in Bratislava, graduated from the Janáček Academy of Performing Arts in Brno, where he is today working as a teacher of Orchestral conducting. Mr Štúr made his conducting debut at the SND opera house with Mefistofele (Boito) in 1996, which opened up further opportunities for him. Here he then studied in the opera productions The Daughter of the Regiment (Donizetti), A Masked Ball, Il Trovatore and La Traviata (Verdi) which he conducted on tour in Japan in 2004 (with the soloists Peter Dvorský and Maria Guleghina), the Barber of Seville (Rossini), The Magic Flute (Mozart), The Bartered Bride (Smetana), Nabucco (Verdi), Andrea Chénier (Giordano), The Maid of Orleans and The Queen of Spades (Tchaikovsky), Faust and Margherite (Gounod), Manon Lescaut and Triptych (Puccini), the ballets Andersen (Nedbal), Spartacus (Khachaturian), La Sylphide (Lovenskjold) and Romeo and Juliet (Prokofiev). He also conducted Tosca (Puccini), Così fan tutte (Mozart), Falstaff (Verdi), Lucia di Lammermoor (Donizetti), Werther (Massenet) among others. Since 1999 he has regularly worked with Peter Dvorský in a number of performances at the SND Opera and in concerts with leading orchestras in Slovakia, the Czech Republic and Austria. He conducted P. Dvorský in a concert with Montserrat Caballé (2000), Gabriela Beňačková (2002), Ilona Tokody (2003) and Anatolij Kotscherga (2006) as well as a combined concert with Eva Urbanová and Elena Obraztsova in 2002. Together with the Prague Chamber Philharmonic Orchestra and Mr Dvorský, he recorded a CD entitled Vivere. In 2017 he conducted a concert with the soloists Bryan Hymel and Irini Kyriakidou at the Smetana Hall in Prague. 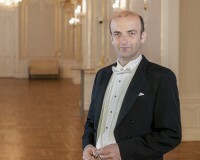 Mr Štúr often conducts performances of important Czech works with foreign orchestras. In 1999 he prepared Smetana’s Bartered Bride with the Orchestre Philharmonique de Strasbourg at the Opera National du Rhin with a selection of soloists from around the world. In 2005 he conducted Dvořák’s oratorio The Spectre’s Bride with the São Paulo Symphony Orchestra (Eva Urbanová, Ľudovít Ludha, Peter Mikuláš). Together with the Chinese orchestra NCPA (National Centre for the Performing Arts) he performed Dvořák’s Rusalka (2016). This was the historically first performance of a Czech opera in China and the first opera in the world to use 3D technology. He has wide experience with foreign orchestras, opera houses and leading soloists. He toured Spain with the orchestras the Czech Virtuosi (2001) and the Janáček Philharmonic Ostrava (2003). In 2004 he conducted at the opera in Graz (The Elixir of Love; Donizetti), in Giessen (The Barber of Seville; Rossini), in Essen (Così fan tutte; Mozart), performed with the Southwest German Philharmonic in Konstanz and the soloist Heinrich Schiff, and with the Moscow Philharmonic. He regularly cooperates with the FOK Prague Symphony Orchestra with which he performed in Nuremberg (2003), Wrocłav (2004) and Merseburg (2005), toured the USA and performed at the Ema Destinnová festivals in České Budějovice (2008) and Shanghai (2013). He conducted the Czech National Orchestra with Ute Lemper at the Prague Proms Festival in 2008, with Gabriela Beňačková and Eva Urbanová at the Berlin Konzerthaus (2008) and with Lawrence Brownlee and Mojca Erdmann in Prague (2012). In 2014 he conducted concerts with Joseph Calleja in Prostějov and at the Tchaikovsky Hall in Moscow. Simon Keenlyside and Štefan Kocán were soloists with the Czech Philharmonic which he conducted at the Smetana Hall in Prague in 2015. He has also performed with the Cairo Symphony Orchestra (2010) and the State Academic Symphony Orchestra of Russia “Evgeny Svetlanov” at the Large Hall of the Moscow Conservatory (2017). Rastislav Štúr regularly cooperates with the Slovak Philharmonic in different concert cycles, and has conducted the Orchestra in Cologne (2003 and 2005), Interlaken (2005), Ingolstadt with the soloist Mischa Maisky (2010), on a concert tour of Spain (2010 and 2016), in a concert in the Tonhalle Zürich with Edita Gruberová, Pavol Bršlík and Jozef Benci (2012), in Brussels with Jolana Fogašová and Štefan Kocán (2016) and in Rome with Dalibor Karvay (2016). Together with the SPh he has made CD recordings of arias with Jolana Fogašová (2000), of the music of George Gershwin with the soloist Marcel Štefko (2013) and the piano concertos of Johann Nepomuk Hummel with the soloist Andrew Brownell (2013). He was awarded the Frico Kafenda Prize 2011 for exceptional conducting performances at home and abroad, and the “Crystal Wings” Music category prize in 2017.